Happy Friday everyone! I hope you have all had a good week, I know I have. Now let’s get right to the point…this weeks prize! 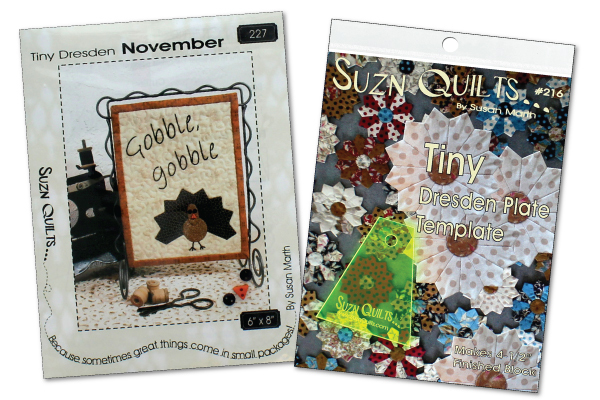 This week we are giving away a Suzn Quilts Tiny Dresden Plate Template and Tiny Dresden November Pattern! Suzn Quilts Tiny Dresden Plate Template is an acrylic template used for accurately cutting a 12 petal Dresden plate pattern. It is bright green for high visibility on dark fabrics and has a hole at the top for safe keeping. Suzn Quilts Tiny Dresden November Pattern design has a turkey with the words “Gobble, gobble”. Includes instructions, templates, and tiny buttons to complete the turkey face. Every Friday we’ll post a giveaway on Think Crafts and all you have to do is comment on the blog post answering the question of the week. We’ll pick the winners and contact them via email. Deadline is midnight tonight and the winner will be announced Monday. One entry per person please. Question of the week: What food could you not live without? I would have to say CHEESE! If the comment box is not below, scroll to the top and click “replies”. This entry was posted in Crafts and tagged Free Stuff Friday!! on October 20, 2017 by Kimberly. I could never live without fruit or vegetables. I am not vegan but I love spinach, apples and berries. I also can not live without coke but it not fruit….. This question is an easy one CHOCOLATE-CHOCOLATE-CHOCOLATE. Pasta – I can’t imagine life without the comfort of a nice pasta dish, and with so many types of noodle and sauce (and other ingredients) there’s always something different to fit your need or mood. For me, it would be nut butter, preferably peanut but almond or cashew work, too! I would have to say – CHOCOLATE!